This week's French Fridays with Dorie was super simple - green beans mixed with crispy pancetta and finished with a drizzle of olive oil. Here in the South, we like our green beans cooked until they are soft, tender and are a mere shadow of what they started out as. I like to have a crisper green bean every once in a while but I knew this dish would be a tough sell to my husband and wasn't sure how my girl would recieve them. The husband hated them even after a boiled and sauteed them longer than the recipe called for and my daughter liked them quite a bit. I enjoyed the saltiness of the pancetta and also the finish with olive oil. However, I wish I had thought to use my super delicious olive oil that I bought in Chianti. All in all it was nice to have a recipe this week that only called for a few ingredients and came together quickly and easily! 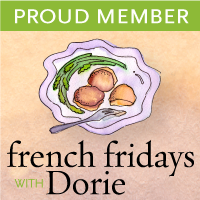 To check out what the rest of the French Fridays with Dorie group thought of this one, visit here! I hope some day your dear husband will see the light and enjoy crunchy green beans! Too bad your husband didn't enjoy this different style. It's a delicious dish nonetheless. They look great, even if they receive mixed reviews at your house. MMMM. These were good. I don't know how anyone could not be in love with a crunchy bean! I too am from the south so I understand green beans that have been cooking on the stove for hours, but I did love these. It is nice to have an easy recipe one week. Great post. Next time just open a can for your hubby and enjoy the new methods yourself. Those canned green beans are cooked to death and he'd probably love them. My mom's the same way...she thinks they are not cooked it they have "crunch" remaining. They look so pretty! I loved the little crisped up bits of bean. I liked the crisp tender beans. Yours look lovely even if the whole family didn't love them. 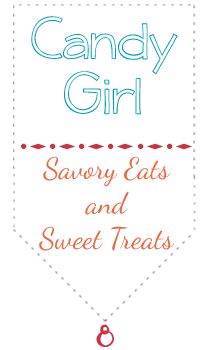 I can imagine that salty and yummy pancette with these green beans - a great recipe! Your daughter has great taste! I thought i'd have trouble selling the idea to the kids as well and was prepared for a fight, but they really liked them as well! My three teens ate these beans! Im glad your daughter liked them too! They look great! My partner likes his vegetables on the soft side, too, but I'm slowly converting him to the joys of crunchy veggies! I'm also from the south so grew up on mushy vegetables but I've seen the light! Don't give up on your husband; he might yet convert.